Have you ever seen Cartoon Network’s Adventure Time? I just started watching the show and I’m hooked! A popular children’s program might not seem like a natural choice for a Geek Chic article, but it actually has a big teen and adult following. It’s a totally fun and quirky show that also features some great characters and mythology. 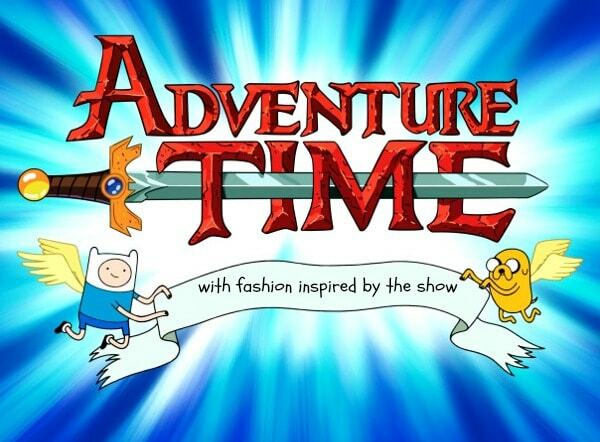 Adventure Time was created by Pendleton Ward in 2010. The show is currently on its 6th season. It’s set in the land of Ooo and follows the lives of Finn the Human, a brave and gutsy boy, and Jake the Dog, his magical adoptive canine brother. In each 11-12 minute episode, the duo battles various monsters as well as the nefarious Ice King, who is constantly trying to abduct a princess to be his bride. Finn, voiced by Jeremy Shada, is a 15-year-old boy who loves adventure and saving the day. He’s easily excitable and overly energetic, but he’s a true hero at heart. 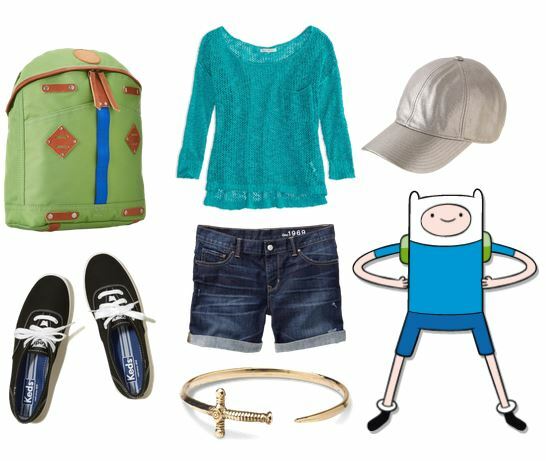 For your own adventure time, try out this practical and comfy outfit inspired by Finn’s signature ensemble. Slip on a lightweight teal sweater and cutoff shorts for a casual look, then accessorize with a golden sword bangle and a metallic baseball cap (a slightly more wearable take on Finn’s bear hood). Finally, stow all of your adventuring essentials in a fun green backpack that resembles Finn’s. Jake, voiced by John DiMaggio, is a magical dog with the power to change his shape and size: he can become enormous or shrink until he’s tiny, or he can mold himself into other shapes. 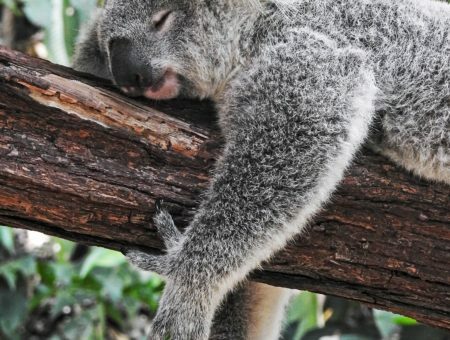 He’s laid-back, sarcastic, and more than a little bit lazy. However, Jake frequently uses his stretchy powers to help Finn out on his various quests. Channel Jake’s easygoing nature with a breezy patterned romper and a lightweight waterfall cardigan. Stretchy black sandals reference his powers, while a rainbow-shaped ring alludes to Jake’s romantic interest, Lady Rainicorn, a flying half-unicorn half-rainbow creature. Marceline, voiced by Olivia Olson, is the baddest chick in Ooo. She’s over a thousand years old, plays a bass guitar made from a giant battleaxe, and she’s quite the trickster. 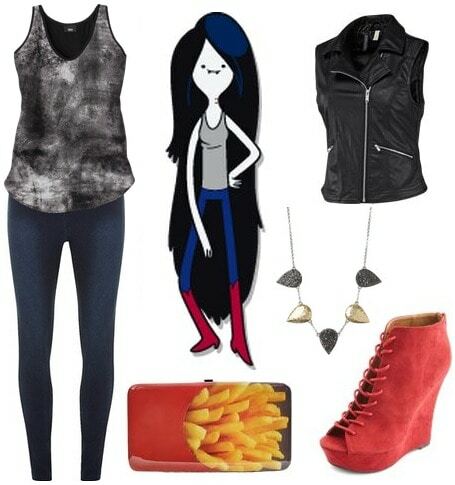 Unlike traditional blood-sucking vampires, Marceline only eats the color red. 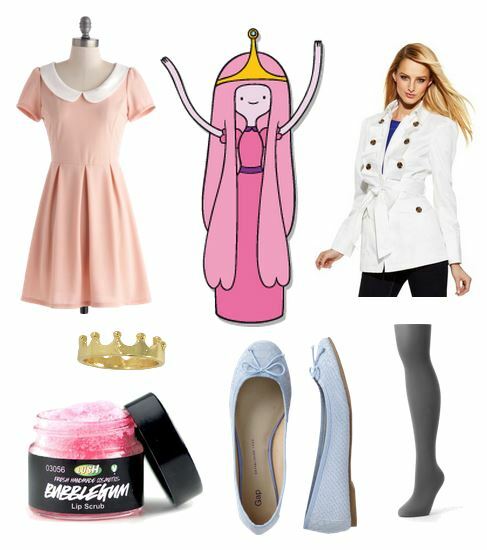 Princess Bubblegum, voiced by Hynden Walch, is the intellectual, science-loving ruler of the Candy Kingdom. Finn has a bit of a crush on the kind-hearted princess. Get a look as sweet as Bubblegum’s with a pretty pink frock and a pair of pastel ballet flats. A crisp white trench alludes to her lab coat, while a crown ring references her royal status. Finally, an adorable pink lip scrub will be sure to put a smile on your face! The grumpy Ice King, voiced by Tom Kenny (aka Spongebob Squarepants), is determined to marry one of the many princesses that inhabit Ooo. With the help of his penguin friends, he frequently carries out nefarious plans to abduct a bride, but his attempts are always foiled by Finn and Jake. 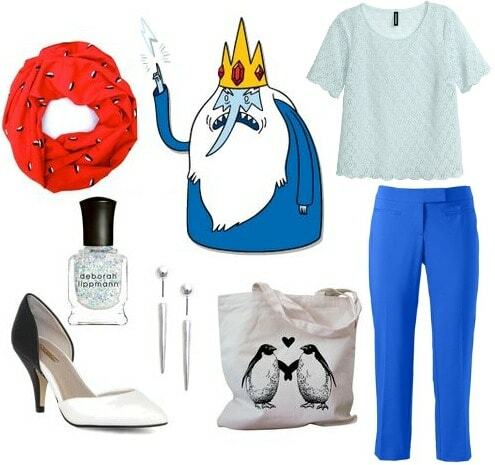 For a more polished (and less crazy) take on the Ice King’s royal robes, go for a monochromatic look featuring a pale blue lace top and bold cobalt trousers. Jazz it up with two-toned pumps and icicle-like earrings, then pay homage to Gunter the Penguin with a penguin-emblazoned scarf and tote bag. Finally, a coat of glittery nail polish adds an icy touch! Would you wear these outfits? Have you ever watched Adventure Time? What other geeky inspirations would you like to see? As always, let me know in the comments!